Books teach us how to say “No!” – they fill up entire shelves in bookstores to help us achieve professional success and personal freedom. Rejecting requests from others helps us de-clutter our busy day and protect us from time-suckers and commitments we immediately regret. Intrapreneurs are driven by their passion and belief in the idea they develop and seek support for. They also often stand outside the ordinary structure and processes of the organization. Intrapreneurs need to pull voluntary favors from people they have no control over in order to find support, funding, protection, expertise or whatever else their project requires to get off the ground or move forward. For Intrapreneurs, avoiding the “No” becomes even more crucial: once they received a “No” to their proposal or request, it is hard to change their mind no matter how much sense the project makes. Put yourself in the shoes of a potential sponsor, lets say a manager, executive or technical expert: this Intrapreneur, a person you may or may not know well, walks into your office and requests resources, money, time, or whatever to fuel an uncalled for project with an uncertain outcome that was not budgeted for and that disrupts your operations. The safe and easy thing is to say “No.” When rationalizing in retrospect, you just saved the company diverting and possibly wasting resources on this crazy project that may even have felt like a surprise attack! – And so you feel good, right? Now, when the Intrapreneur comes back later to try his or her luck again, perhaps equipped with more data, what can you do? If you said “Yes” this time around, wouldn’t you be inconsistent with your previous position and possibly even undermine your own authority? Subconsciously, you may already be biased and seeking a face-saving way to get over this discussion. So it’s safe again to stay with “No,” and remain consistent – and feel good! After all, it’s human nature! As an Intrapreneur, coming back to ask for a “Yes” again is an uphill battle, a double sell. You are basically wasting your energy fighting human nature rather than helping your cause effectively. Chances are you will not be able to turn around a previous “No” into a “Yes,” no matter how much more data and other good arguments you throw at the aspired sponsor. When seeking voluntary support from others, hearing a “No” is a huge obstacle that is hard to overcome. 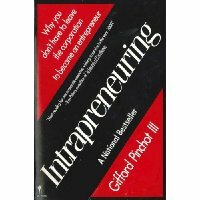 So, for an Intrapreneur, the million-dollar question (perhaps literally!) is, how to avoid the “No” in the first place and get support for the idea. For an Intrapreneur, it is most important to listen closely and be open to the questions and concerns the sponsor to-be brings up: they may just as well uncover valid flaws or complementing areas to be addressed to make the idea succeed in the end. Gifford Pinchot, the author of the best-selling book Intrapreneuring, suggests these nifty tactics for Intrapreneurs to approach helpers or sponsors in a non-threatening or overly demanding way that would trigger the negative response. A small step forward is better than a full stop of the “organizational immune system” kicking in. Don’t ask bluntly for resources of sorts. Instead, ask for advice or a reference to a co-worker! People love to talk about themselves and being asked for their expertise and opinion. This works with employees on all levels of the hierarchy no matter if you seek a sponsor or advice from an expert. By asking for advice, there is no Yes-or-No dead-end involved. It’s just a factual discussion among professionals about an idea and what it would take to improve it and to move it forward. Even softer is the question for help to find someone else, who could help or whom the Intrapreneur should talk to next. Even if not interested in the idea themselves, it allows the potential sponsor or expert to refer to another person, who is possibly better suited or more interested without losing face or appearing unsupportive. In case the idea or project tanks, as the expert/sponsor you didn’t waste any resources nor will you be held accountable. If, in contrast, the idea has a positive outcome down the road, you may even claim having supported it at an early stage or have made a key introduction that led to the project’s success. Now, that feels good no matter what happens with the Intrapreneur’s idea or project, right? That’s human nature too. From the Intrapreneur’s perspective, for starters, you achieved to avoid the “No” kiss-of-death. You may have even got another lead or hint on what to improve or consider, something you overlooked or were not aware of before. Addressing this may require some more research, data or conversations, but for now, it drives your idea forward to take the next step, which is good and helpful. It’s not really rocket-science but rather dealing with human nature in a resourceful and constructive way that keeps the intrapreneurial project moving forward. Previous Previous post: 10x vs 10% – Are you still ready for breakthrough innovation?